Whether you’ve tried CPAP and it didn’t work or you simply want a less invasive treatment method, Green City Dental can help. Sleep apnea can be caused by a tissue obstruction, misaligned jaw or collapsing tongue. An oral appliance helps stop this by gently moving the lower jaw and tongue forward. With more room in the back of your mouth, there’s less chance of obstruction during sleep. With mild or moderate sleep apnea, oral appliance therapy can be a big help. Some cases call for a MicrO2 appliance. Each is custom made with the latest CAD-CAM technology, ensuring a comfortable fit that will let you get a good night’s sleep. 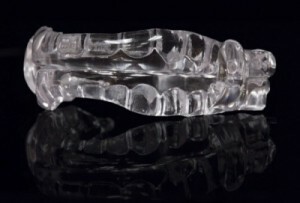 The device is lightweight yet durable, biocompatible and removable. Other times, a DNA appliance is more suitable. This FDA-approved device works on the concepts of Pneumopedics® and Craniofacial Epigenetics to actually remodel the airway, making it easier to breathe freely and consistently during sleep. In this way, it actually addresses the root cause of the problem, providing long-term relief. Appliance therapy for obstructive sleep apnea: minimally invasive treatment at its best! While there are plenty of over-the-counter devices that claim to help with sleep apnea, they have not proven especially effective. Those that do relieve snoring may do nothing to address the apnea. The expertise of a dentist is needed in order to properly fit the appliance, customized to your bit and level of OSA. An ill-fitting device won’t help. More, each of our custom appliances is made with neuromuscular bite, which brings the jaw forward in a comfortable, physiologically appropriate way – not arbitrarily, as an off-the-shelf device does. Because the appliance has a direct impact on your teeth and jaw, it’s important to have a dentist oversee the entire process to ensure all tissues and structures remain in good health throughout treatment. While research shows that oral appliance therapy is an effective remedy for snoring and mild to moderate OSA, it’s not the only option out there. Nightlase is a proven laser treatment that widens the airway by tightening the soft tissues at the top of the airway, renaturing and restructuring collagen. No anesthesia is needed, and there’s no post-op pain. Typically, just three 20-minute treatments over a six-week period is all it takes – though many report improvement even after just one treatment! – and results can last for up to one year before retreatment is recommended. This minimally-invasive procedure has been shown to reduce snoring by 74%. It’s totally safe and, time and again, has proven highly successful with our patients, grateful for a better night’s sleep. Before you seek treatment, you will need an accurate diagnosis. Yet sleep studies can be both expensive and extremely inconvenient. Fortunately, excellent home monitoring units are available. When you consult with Dr. Taylor about your trouble with sleep disordered breathing, she can loan you a Nox T3 monitor to use in your home. This wireless device is easy to use and comfortable to wear while you sleep – and the data it provides to Dr. Taylor is thorough and superb, allowing her to make an accurate diagnosis. Once we have that, Dr. Taylor will be happy to provide you with the right oral appliance to help treat your sleep apnea.